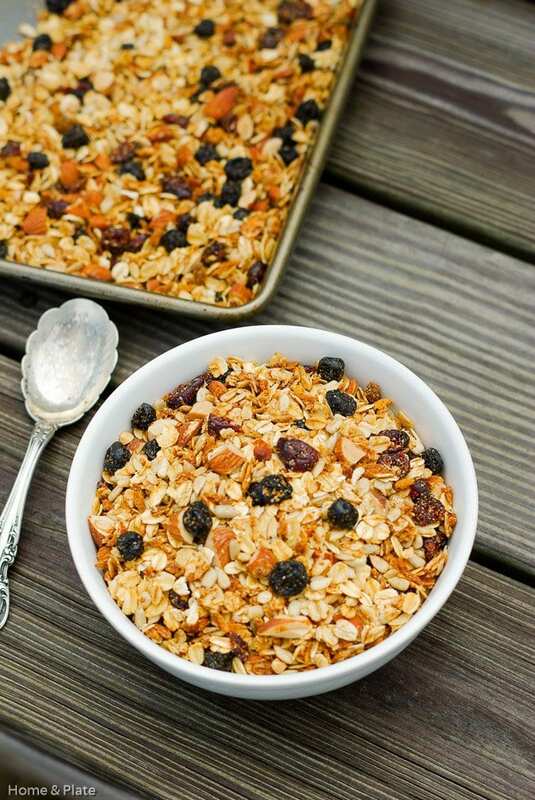 This Homemade Maple Almond Granola is packed with healthy nuts, oats and dried fruits and is high in protein, gluten free and vegan. I prefer a healthy start to my day and this recipe is so easy to make and so versatile. 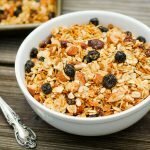 This Homemade Maple Almond Granola is packed with protein, is 100 percent gluten free and completely vegan. It’s a perfect way to start your morning. 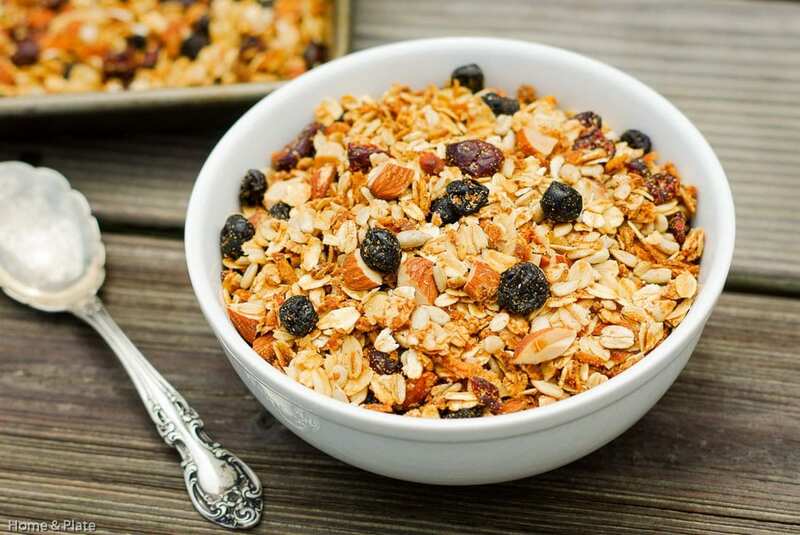 Sprinkled over bran flakes, added to a smoothie or mixed with yogurt and fresh fruit, this Homemade Maple Almond Granola is crunchy and sweet. Delicious without the guilt. This recipe takes an hour and 30 minutes to make from start to finish and the hardest part is chopping the nuts. It’s also a versatile recipe. The main ingredient is old-fashioned oats, an essential ingredient. Feel free to swap out the nuts or mix them up. I love almonds in this recipe but pecans and walnuts would be great in granola too. Just remember you need 1 cup of nuts. Same goes with the sunflower seeds. If you like flax, chia or pepitas, better known as pumpkin seeds, feel free to substitute or mix it up. The bulk food section of your grocery store is a great place to check out all the options. If you don’t have authentic maple syrup use honey. And feel free to swap out the oil for any kind you’d prefer. Coconut oil is delicious in granola. You get the idea! How to make this granola nut free? Substitute oat bran, wheat germ or just add more old-fashioned oats or seeds. Now I’m a stickler when it comes to the dried fruit. I like a mix of raisins, dried cherries, dried cranberries and dried blueberries. 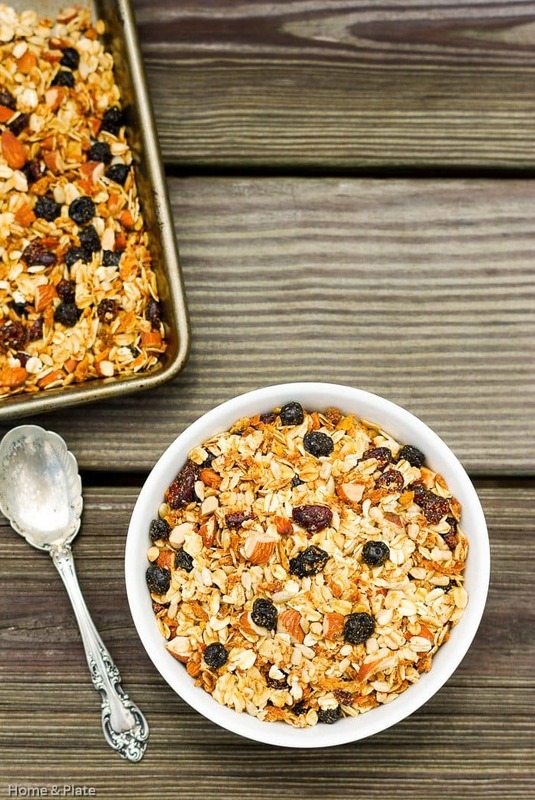 The fruit provides that extra sweetness that is just delicious in this granola. OK…I have a secret. I’ve been known to throw in dark chocolate pieces. After all they say dark chocolate is good for you! Preheat the oven to 250°F. In a large bowl combine the oats, nuts, brown sugar and coconut. Next, pour in the oil then the maple syrup. Mix well to incorporate the wet ingredients into the dry and pour onto rimmed cookie sheets. Cook for 1 hour and 15 minutes stirring every 15 minutes. Add the dried fruit after the granola has cooled. yep, I like dark chocolate in my granola too, and all the dried fruit! this sounds GOOD. Nothing like a little sweet chocolate to start the day. Thanks Kristina. So many great ingredients in there. A good way to start the day, end the day or have a great snack! Thanks Kelly. Perfect for any time of the day. 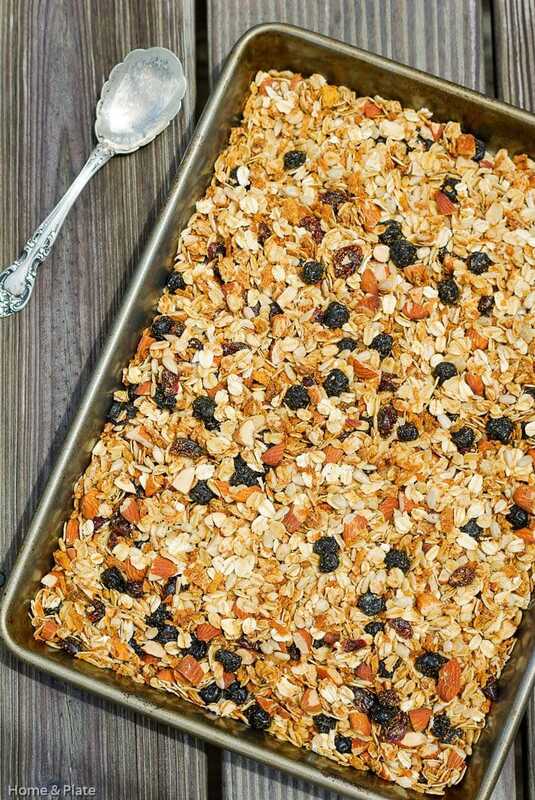 Such a simple lovely granola! Thanks Rebecca…simple and easy is my kind of granola.